DVD: Toho Company Ltd and Magnolia (USA). Language: Japanese with English and Spanish subtitles. Ratio: 1.85:1. Length: 1:18:00. Colour. Dolby Digital 2.0 Stereo. Extras: Includes a “Making of Pulse” featurette with an interview of the director, and trailers. Region: 1. 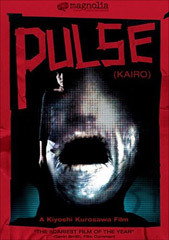 Looking at Kurosawa Kiyoshi’s Kairo (Pulse, 2001) again on DVD, it is all the more apparent that the ironic subtext is that with all the means of connecting with others – email, webcams, the cellphone – people are still alienated. Kawashima (Haruhiko Katô), the computer-illiterate economics major, doesn’t seem to have anyone, neither friend nor family (that said, he’s the most resilient, and most persistently optimistic of anyone in the picture); pretty Harue (Koyuki), to whom Kawashima is attracted, has acquaintances – the students she helps out in the computer lab, the graduate student Yoshizaki (Shinji Takeda) – plus she’s more aware of what’s going on, but if anything this makes her more susceptible (it’s the computer geeks that fall victim first). The one group that shows any cohesiveness are the employees of Sunny Plant Sales, a tiny business that grows orchids and other exotic plants on a rooftop greenhouse. Michi (Kumiko Aso), one of the employees, is worried for Taguchi (Kenji Mizuhashi) and visits him at his apartment (where he promptly hangs himself); she and fellow colleagues Junko (Kuruma Arisaka) and Yabe (Masatoshi Matsuo) meet at a café afterwards to talk about the suicide, and it’s clear from their interaction that they (and the absent Taguchi) were friends. Michi also has a scene with her Mother (Jun Fubiki) – the only one in the whole film involving a parent and her child – and their conversation, casual as it may sound, skirts around the film’s theme – the mother is worried for Michi, and asks her to contact her father; Michi replies that far as she’s concerned, her father has his own life, and she’d rather not bother him. Michi’s mother, accepting her refusal, warns her to be careful – she’s too open, too trusting. Later, Michi watches a TV news segment about a man who tossed a bottle in the ocean in Japan only to have it picked up in Malaysia, 2,500 miles away; the screen freezes, leaving the newscaster with half his head gone. She backs away from the TV screen, only to be startled by a bottle falling over. Is Michi upset by the frozen half-head, or by the fact that the TV, a medium of communication, has stopped communicating? Is Kurosawa playing a little joke here involving bottles – one of which, ironically, does manage to connect one human being to another, one of the oldest and most primitive forms of communication there is? The boss explains an attitude that sounds reasonable, but which – when you think about it – has helped render society vulnerable to just the kind of attack being mounted in the film. The circular nature of the shot (Kurosawa seems to like to shoot key moments in long, serpentine takes) gives the boss’ words an ominous force – they seem to encircle Michi, surround her, leaving her with no avenue of escape. The scene ends with Michi running past her boss downstairs to look for Yabe – a futile gesture of defiance, as it turns out. Kurosawa includes hints on the sources of his various evils (the old building in Kyua [Cure, 1997] comes to mind); this one has about as straightforward an origins story as anything he’s done, told in a flashback – about a man who sealed a room off with red tape (what Kurosawa calls a “Forbidden Room”, apparently a sealed room with a ghost trapped within (this was the prototype)), later to find the room demolished, the ghost escaped through a phone line. In yet another crucial scene, Kawashima finds Harue wandering outside her apartment, soaking wet, brings her inside. The first shot inside the apartment is of Kawashima standing against a wall full of bookshelves – Kawashima finally standing where he wants to be, inside Harue’s apartment, is confronted by a wall full of her books. Confronted by her self, in effect; the high, stuffed bookcases tell him something of her tastes, her interests – an intimate view of the girl, in effect. Kawashima stands up and admonishes the screens. He declares that someday man will invent a drug for immortality. Harue asks if he really wants to live forever. Kawashima has a moment of doubt; “Maybe I’ve got it all wrong”, he admits, sitting down. Harue assures him that she agrees. “It’ll turn out just as you say. Ghosts won’t kill people – that would only make more ghosts. Instead…” and she walks into her room, murmuring. Kurosawa shoots the scene in a single take (just like the scene in the rooftop garden), with the camera following Kawashima from bookcase to just outside Harue’s room, then Harue as she moves from bedroom to bookcase to computer monitors, back to her room. The image – Harue in her room, Kawashima seated outside – is repeated, but with differing significance: the first time Kawashima’s looking away, respectful of her need for privacy (and possibly Harue appreciates his tactfulness); the second time Kawashima watches helpless as Harue shuffles past him, lost in the implications of her awful conclusion. Kurosawa is a master at throwing you off guard with quick, well-timed movements (Harue tossing trash in the air to distract Kawashami, then jamming a gun up her jaw), and unsettling you with the simplest of effects – the simpler the more effective. When Junco is victimized by one of the ghosts she’s reduced to a needy wreck, forever reaching out for human contact (which Michi provides, as best she can); Kurosawa veils her with curtains or stands her opposite Michi lit and framed as if she belonged in a different world, even if they stand in the same room. Sometimes the effect’s even simpler – a television set flashing pictures of people while a broadcaster states the name of missing persons; sometimes it’s just a figure in a dark corner (Kurosawa seems able to generate more dread and terror out of dark corners than any filmmaker I know); sometimes it’s only a voice in a cellphone, crying faintly for help. The Japanese have this fascination with end-of-the-world scenarios – with the sight of Tokyo, one of the most crowded cities in the world, empty of souls (Tokyo as one gigantic Forbidden Room). Possibly it’s the flip side of their work ethic, a consequence of the cultural and societal pressure to be sober, responsible citizens – the more they repress their id, the more they feel drawn to the chaos represented by absolute nothingness. Kurosawa’s expressing this death wish is maybe nothing new, but I do think his vision of an end where everyone’s trapped in his own loneliness is. It’s two hells (isolation and the apocalypse) for the price of one.